"Did you not tell them they were the Lord's chips?" After a tussle with Esteven (Esqueleto), Ignacio returns to the orphanage to serve porridge (or whatever) without chips. When questioned about the meal sans chips, he had to admit that they were stolen. Which brings us to the line above, as though it would have been a deterrent to the thief. According to scripture, this quote is accurate. If the earth is the Lord's & everything that is within it, then it naturally follows that the chips are his as well. This, believe it or not, goes back to the argument made in the Talk of Holy Things post regarding the Sacred, Secular & Sin. To keep things short, everything is sacred for the believer. This passage is commonly cited (among others) to promote Christian Liberty. That is to say, the fact that all things are lawful for Christian consumption. We have no need to worry about inherent evil in material things. Dietary restrictions have been lifted. Ceremonial laws no longer bind us. Those chips are holy because they are the Lord's. However, remember that not all things are profitable. Those chips might go straight to your hips; in the same way there are some liberties that, when taken too far, may end up causing harm. I suppose what we are trying to avoid here is legalism--the evil of taking what God has made clean & restricting access to it. Particularly with regard to foodstuff, there is no sin save the sin of gluttony (an unhealthy lust for food). God created food for pleasure & sustenance. Think of some mundane aspect of your life. Have you ever considered that it belongs to the Lord? Have you considered that it may be a tool with the potential to tweak your relationship with God? 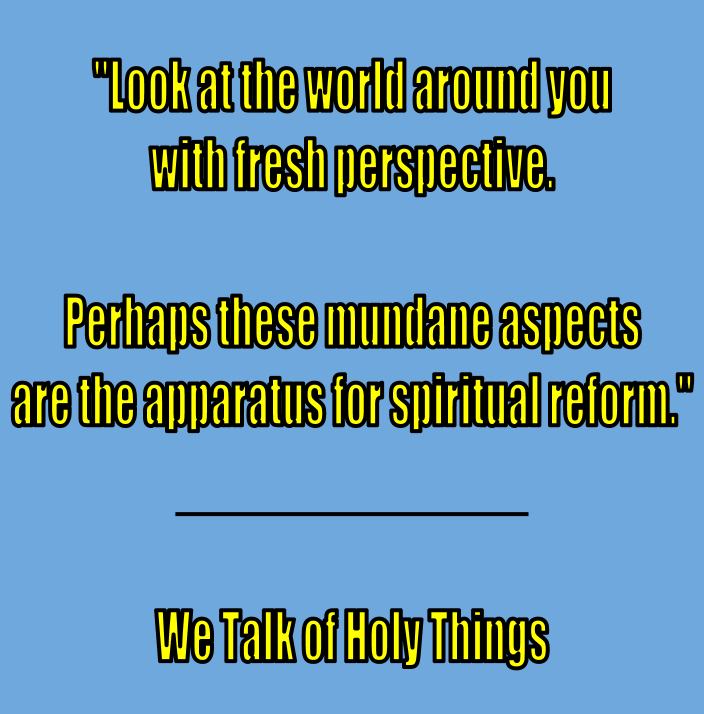 Look at the world around you with fresh perspective. 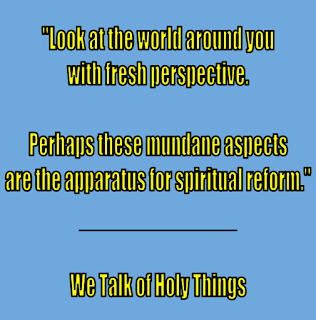 Perhaps these mundane aspects are the apparatus for spiritual reform.